Traveling with your canine best friend can be super rewarding, and all the outdoor spaces around Bishop make it an ideal place to bring your dog. As you’re planning your trip to Bishop, here are some options for keeping your pet happy and healthy throughout your journey. Whether you are passing through town with Fido or are spending some time vacationing here, there are a number of lodging options in Bishop where you can bring your pet. Each has different guidelines, so it’s best to check before your visit. For example, some places require you to have your own pet bedding, some set aside a dedicated pet room for you and some charge a pet fee. Is your pet restless from long car rides? At the corner of E. Yaney St. and Spruce St. lies the Bishop Dog Park where you can let your dog run and play and have their own social hour. Be sure you check the simple rules before entering the park. Many indoor restaurants are prohibited from allowing pets in the dining facility, but some restaurants have outdoor patios which are pet-friendly. Those that do include: Astorga’s Mexican Grill, Bishop Looney Bean, Bishop Burger Barn, Black Sheep Cafe, Erik Schat’s Bakkery, Great Basin Bakery, Holy Smoke Barbeque, Mountain Rambler Brewery, Pizza Factory, and The Upper Crust. While all these places welcome pets, don’t forget that not everyone will be delighted to feed your dog table scraps—be corteous, bring a leash and maybe even a water bowl. Or if you are craving some cuisine that doesn’t feature outdoor seating, consider a picnic—grab some to-go dinners and take your best friend with you to the City Park for a fabulous outdoor dining experience. Stop by the Meat House at 150 S. Main Street for a special dog bone or two. Maybe you both need to stretch your legs after sitting in the car? Just on the outskirts of town there are a few canals with dirt roads alongside them which offer fantastic walking for both you and your pooch. On the east side of town there is a canal which runs North-South. Either walk through the cattle gates at the North end by the Vons/Kmart complex, or join the canal on either side of East Line Street. On the northwest side of town there is a canal off Highway 395 that is accessed through a gate. Use the map below to navigate to either one. Be mindful that these open spaces can include dangers for dogs such as rattlesnakes and coyotes, so it’s wise not to let Spot wander too far from your watchful eye. And depending on the season, there may be cows. Welcome to the rural countryside. Please pick up after your pet. Period. Even in natural open spaces, it’s just good manners. Keep pets on a leash within the City of Bishop limits. Maintain control of your pet at all times, be respectful of wildlife and other people. Hopefully you will never ever have a pet emergency on the road. But it’s good to know where to go if you do. 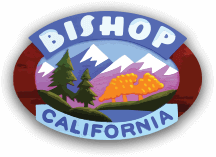 In Bishop there is the Bishop Veterinary Hospital and Mountain View Animal Hospital. Maybe your trip includes a day or two of pet-free activities and you need to board your dog. Check out the boarding at Bishop Veterinary Hospital, or Relaxing Furr Pet Kennels. Finally, don’t forget to pack for your pet’s needs! A favorite toy, bed, dog bowl, leash, food, yummy treats and poop baggies are good essentials. And you can rest easy knowing you won’t have to face sad, sorrowful eyes that think you’re leaving them behind. >>>Here is a great blog post about Bishop as a dog-friendly destination.